Setting an infinite control switch to control the heating elements in a glass fusing kiln. 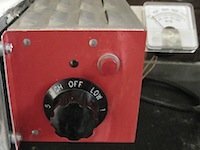 The control switch on a glass kiln can be likened to the type of control switch fitted to an electric stove. Unlike digital control warm glass kilns, infinite control kilns are manually set. Heat can be set from Low to Max. This type of switch selects a heat setting rather than a temperature. Control switches are designed to provide a kiln with power for a period of time and remove power for a period of time. This cycle is repeated over and over, with on/off depending on the position of the switch. On a low setting power may be applied for about 25% of the time and off for the remaining 75%. As you rotate the switch to the higher settings it will remain "on" for a longer time increasing the heat in the kiln-firing chamber. Glass fusing kiln temperature is relayed from a thermocouple in the firing chamber to an external gauge called a pyrometer, enabling the correct fusing rates and temperatures to be set and monitored. The switch must be manually adjusted during the glass fusing process. It is necessary to be present during the warm glass fusing cycle to ensure the correct temperatures are set. Kilns with this type of switch have very few components and are easy to maintain. On small tabletop kilns the goal is to reach 1000 F (538 C) in about an hour. The switch is usually set to low for 30 minutes and then set to medium until the kiln reaches 1000 F.
Rotate to high until glass fusing occurs, monitoring the temperature to ensure the kiln does not over fire. Switch off when glass has fused. Follow the makers' directions regarding venting the kiln to bring the temperature down to 1100 F.
This is accomplished by opening the kiln slightly to let heat escape. The kiln must then be closed and the glass allowed to anneal. Usually the annealing temperature is unknown, as the manufacturer does not give it. In this case you can do a "shotgun anneal" allowing the glass to cool slowly over a period of time. This slow cooling will usually take place between 1100 F (593 C) and 600 F (316 C). Thinner glass will cool quicker than thicker glass. A long annealing period will not hurt the glass. Small tabletop kilns are very good at producing fused art glass jewelry. Generally firing schedules are straight forward and do not require frequent changes. Thicker projects may have kiln-firing schedules that require a lot of adjustments during the fusing and cooling cycles. Firing schedules will vary subject to glass type, size and thickness.